One of the most versatile and disruptive defensive ends in the nation in helping Florida State’s defense lead the nation in yards allowed per play (3.86), rank second nationally in total defense (254.14 ypg) and rank in the top six nationally in scoring defense (14.71 ppg), rushing defense (92.29 ypg), pass defense (161.86 ypg), pass efficiency defense (95.43) and opponent three-and-outs (6.29 per game)…ranked third in total sacks (13.0) in the NCAA and first in the ACC while also ranking 14th in the NCAA in sacks per game…led the nation in yards accumulated on tackles behind the line of scrimmage (134)…only one player in FSU history recorded more sacks in their first three seasons than Werner and that was Peter Boulware…after just two years of high school football in the U.S., Werner amassed 35 TFL, 23.5 sacks, 18 passes defended, three forced fumbles and two fumble recoveries in three seasons in Tallahassee…moved into the top 10 all-time at FSU for TFL in just 27 career starts…ranks fourth all-time at FSU for TFL recorded in the first three seasons of a career…over the last two seasons, recorded a sack or TFL in 17 of FSU’s 27 games and recorded a tackle in 34 consecutive games…one of only two defensive linemen in the NCAA to have eight or more pass break-ups…posted 42 tackles (30 unassisted), 18.0 tackles for loss which ranked second in the ACC, 13.0 sacks, five quarterback hurries, one forced fumble and a fumble recovery…came one TFL shy of tying a 45-year old FSU record when he racked up five in the season opener, also recorded four sacks and a pass batted down…versus Boston College, almost single-handedly thwarted the Eagles on four attempts to score from the FSU one-yard line by recording a PBU on first down, a tackle for no gain on second down and a QB hurry on fourth down causing an incomplete pass…played arguably the best game of his stellar FSU career recording 3.5 sacks, a career-high tying six tackles and a fumble recovery for nine yards versus No. 4 Florida in the regular season finale…named the most valuable player on defense for the second straight year at the team’s annual banquet. 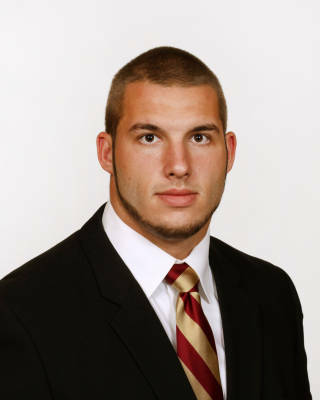 A rising star from his left defensive end position, Werner started all 13 games…registered a career-high 37 tackles, including 25 solo stops, for an FSU defense that ranked second in rushing defense, fourth in scoring defense and sixth in total defense…led the Seminoles with eight quarterback hurries and two fumble recoveries, which included a 25-yard TD return against Clemson…ranked second on the team with a eight pass break-ups and nine passes defended…collected his first career interception with a leaping grab at Boston College…ranked second among Seminoles with 11 tackles for loss and seven sacks…established a new career-high with six tackles, including a sack among two tackles for loss against No. 1 Oklahoma which earned him ACC Defensive Lineman of the Week honors…turned in a monstrous game at Duke with four pass break-ups, two quarterback hurries and a sack…his four pass break-ups against the Blue Devils were the most by an FBS defensive lineman since Nebraska’s Ndamukong Suh batted down four against Virginia Tech on Sept. 19, 2009…posted a career-high two sacks at Wake Forest…added two tackles including a tackle for loss and sack in the Champs Sports Bowl win over Notre Dame…earned Capital One CoSIDA Academic All-District honors…recognized for his work in the classroom with one of eight sophomore academic awards and named one of three defensive MVPs at the annual team banquet. Appeared in all 14 games as a true freshman, registering 20 tackles, including 6.0 tackles for loss and 3.5 sacks…relentless pass rusher who frequently overpowers opposing tackles…three sacks came over the course of the first four games…registered a career-high five tackles in the win at Maryland…twice collected 1.5 tackles for loss (Samford, Wake Forest)…also had a pass breakup to his credit…earned an academic achievement award at the 2010 football banquet for having one of the top GPAs for his class. German exchange student who played only two years of high school football in the United States…was a four-star prospect by Scout.com…had a three-star ranking from Rivals, which ranked him as the No. 65 defensive end nationally and the No. 6 prospect in Connecticut…No. 24 defensive end prospect according to ESPN…high school teammate of FSU tight end Will Tye…as a senior logged 57 tackles in seven games with three sacks, four forced fumbles and two blocked field goals…also caught 10 passes for 98 yards from the tight end position…played at home for Berlin Adler national team as a junior…as a sophomore at the Salisbury School, had 54 tackles, including 24 for losses, 12 sacks and two fumble recoveries in just eight games…was married over 2010 spring break to his wife Denise…whittled lengthy list of offers to two, selecting FSU over Oregon…born August 30, 1990.